What's With This Guy? - . This guy sat on the other side of the glass door and stared at me for twenty minutes. When he wasn't staring, he was talking. When I walked to the kitchen, he appeared at the kitchen window. More talking. When I went to sit in the living room, he showed up in the front window. He wasn't yelling at me, like that pissed off squirrel that used to give me a piece of his squirrel-mind every morning. This guy was just chatting. When I finally went into the backyard, he did a couple of very close fly-bys near my head, then landed on a patio chair and yakked some more. I tired to introduce a new discussion topic but he dominated the conversation. This guy made it clear, my job was to listen. My parents have a couple of blue jay "friends" that visit like that. When this happens, those birds want peanuts. I suggest unshelled, raw nuts. It keeps the jays very busy hiding them and they shut up. He was telling you that you need to put a birdfeeder out. He's hungry. Then he went on to explain the benefits of the bird feeder not only to himself but to other local and non-local birds. He's obviously related to this guy. I speak blue bird. He said you are Snow White in a Star Wars movie and he wants a bird feeder. 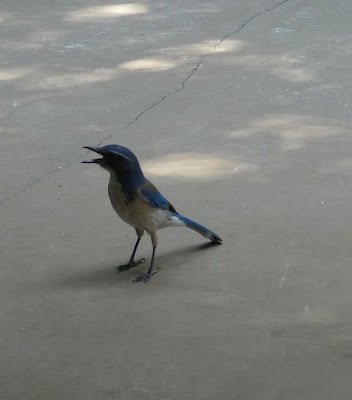 That's a scrub jay. 2 things come to mind. 1. It has a baby who has just fledged and is flopping around outside the nest learning to fly. So it is being extremely protective. I think he's in love with you. Who can blame him? 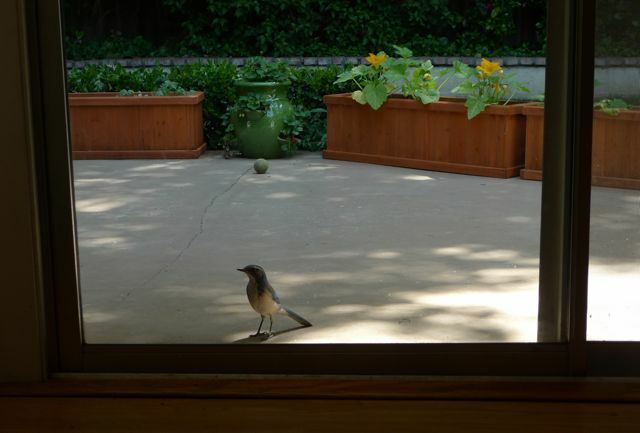 Yup, scrub jay. They are very social. He probably was visiting with you. I think you should go get him some peanuts. He'll have them hidden around the yard in 15 minutes. But just a warning that he'll be tucking them in your planters so the next time you dig in there you will find a couple.